Merchants and site administrators can always add coupons by editing Scheduled Orders. In order to display coupon options to your customers so that they can add and update coupons on their own Scheduled Orders, you must enable this option within your QPilot Merchant Account. To do this, login to your QPilot Merchant Account, edit the site you want to enable coupons for, select the options tab, select "Enable Customers to use QPilot coupons on Scheduled Orders" and click "Update". 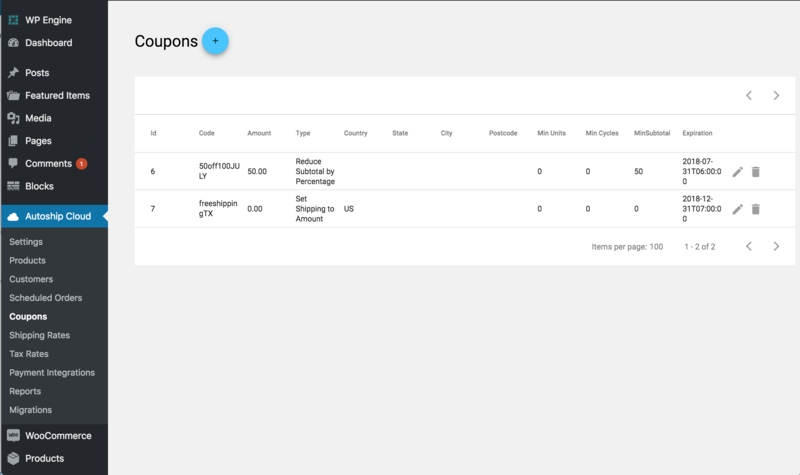 The Autoship Cloud Coupons page displays an embedded report of coupons created for use with Customers and Scheduled Orders. Coupons can be created from this page by clicking the "add" or "+" button. Autoship Cloud Coupons apply only to Scheduled Orders. This means that any rules, discounts or offers you create with Autsohip Cloud Coupons are completely unrelated to the WooCommerce Cart or Checkout - a great benefit to making coupon rules for Scheduled Orders simple to understand and use. Coupons can be applied to Autoship Cloud > Customers as well if you wish for a Coupon to apply to all Scheduled Orders belonging to the Customer. In WP-Admin > Autoship Cloud > Coupons, click the "add" or "+" button and set the desired rules for the Coupon. When you are ready to create the coupon, click "update". Note: coupon codes are CAse-senSitivE! Coupon Amount: enter a number for the amount or percentage. Numerical values only. Depending on the Discount Type, this number will be used as a percentage or a fixed amount. Note: Do not enter symbols like $ or % in this field. Example: set Post Code to "90210" if the coupon can only apply to Scheduled Orders shipped to a 90210 address. Min Units: the minimum number of total units (Product Quantity) required to qualify for this coupon. Example: Set Min Units to "10" if the total Quantity of Products in the Scheduled Order must be 10 or more for the Coupon to apply. Min Cycles: the minimum number of times a Scheduled Order must have processed (aka "Cycled" required to qualify for this coupon. Example: Set Min Cycles to "1" if the Scheduled Order must have processed at least 1 time for the Coupon to apply. Max Cycles: the maximum number of times a Scheduled Order is allowed to process (aka "Cycled" before it is no longer qualified for this coupon. Example: Set Max Cycles to "5" if the coupon should no longer apply after the Scheduled Order has processed 5 times. Min Subtotal: the minimum subtotal of the Scheduled Order required to qualify for this coupon. Example: Set Min Subtotal to "50" if the subtotal of the Scheduled Order must be at least $50.00 to qualify for this coupon. To apply a coupon to a Scheduled Order, edit the Scheduled Order (WP-Admin > Autoship Cloud > Scheduled Order) and enter or paste the Code for the Autoship Cloud Coupon you wish to apply in the Coupon Code field and click "update". If the update was successful, the coupon code was applied. If the update is not successful, you will see an alert appear and the Scheduled Order will not update.